Deborah H. Atkin, MD discusses the multifaceted benefits JUVÉDERM VOLBELLA® XC offers, including lip enhancement, wrinkle reduction, and facial rejuvenation. Del Mar, CA — Full, shapely lips and smooth, wrinkle-free skin are traits that many people seek to achieve through cosmetic enhancement. 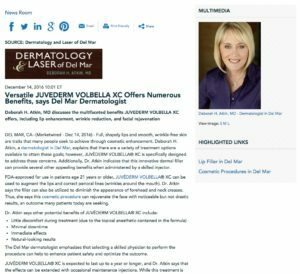 Deborah H. Atkin, a dermatologist in Del Mar, explains that there are a variety of treatment options available to attain these goals; however, JUVÉDERM VOLBELLA® XC is specifically designed to address these concerns. Additionally, Dr. Atkin indicates that this innovative dermal filler can provide several other appealing benefits when administered by a skilled injector. FDA-approved for use in patients age 21 years or older, JUVÉDERM VOLBELLA® XC can be used to augment the lips and correct perioral lines (wrinkles around the mouth). Dr. Atkin says the filler can also be utilized to diminish the appearance of forehead and neck creases. Thus, she says this cosmetic procedure can rejuvenate the face with noticeable but not drastic results, an outcome many patients today are seeking. 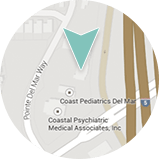 The Del Mar dermatologist emphasizes that selecting a skilled physician to perform the procedure can help to enhance patient safety and optimize the outcome. JUVÉDERM VOLBELLA® XC is expected to last up to a year or longer, and Dr. Atkin says that the effects can be extended with occasional maintenance injections. While this treatment is not appropriate for everyone and experiences will vary, she says JUVÉDERM VOLBELLA® XC can give patients fuller lips and a more youthful-looking appearance in as little as 30 minutes—about the length of a typical lunch break. Dr. Atkin is a board certified dermatologist in private practice in the Del Mar and San Diego area. She earned her undergraduate degree from California State University, Northridge and her medical degree from the University of California, Los Angeles School of Medicine. She completed additional training at Scripps Clinic and Research Foundation and the University of Arizona – Department of Internal Medicine/Dermatology. An active member of the American Society for Laser Medicine and Surgery and the American Society for Dermatologic Surgery, Dr. Atkin has also been the recipient of several honors, including being named Volunteer of the Year by Combined Health Agencies San Diego. She is available for interview upon request.